Tis the season of food and alcohol! Thanksgiving, the day of eating all things gluten, went well with my dietary restrictions. My family is extremely supportive, which made it easy to enjoy the holiday. We used cornstarch for the turkey, rather than flour, and my mother in law made gluten free coconut macaroons, as I wasn’t able to eat pumpkin pie. I enjoyed myself and honestly did not miss stuffing, rolls, or any of the like. With holidays and social situations, it’s best to be positive and honest with friends and family because they love you. Aside from Thanksgiving, social situations have come up with the holiday season in full swing, but they’ve been easy to mediate. Depending on where I’m headed, I will either have a meal before or I will bring my own dish. When going out to a restaurant, I will check the menu before to determine what I can have. There is usually always something, or I can make modifications to an item already on the menu. The simplicity of being at home always wins though. I love preparing my own food because I KNOW what’s going in my body, which is more important than ever right now. I have tried to cook most of my own meals for the past few weeks. I have been reading labels meticulously, and found that anything from a box or jar does not sit well with my tummy. Sorry frozen and precooked food: it’s not you, it’s me. I’ve started making a lot of food from scratch. If I want peanut butter, I make it myself with raw nuts and coconut oil in my food processor. If I want bread, I find a recipe on pinterest and make it gluten free and yeast free by subbing coconut flour. More time consuming, but I find it therapeutic to reserve a few hours to myself on Saturday or Sunday morning and create food that makes me feel good. My first creation is homemade almond milk. Upon reading the label ingredients, I thought it best to make my own while healing my gut. Store bought almond milk has the following ingredients besides water and almonds: cane sugar, calcium carbonate, natural vanilla flavor with other natural flavor, potassium citrate, sunflower lecithin, gellan gum, Vitamin A palmitate, Vitamin D2 and D-Alpha-Tocopherol (Natural Vitamin E). What concerns me about this label isn’t the sugar – it’s the ingredients I can’t pronounce. Store bought almond milk will do fine in the general population’s diet but I am trying to eliminate any possible ingredient that could cause digestive distress. Hence, homemade almond milk! To make homemade almond milk you will need two ingredients: almonds and filtered water. You will also need a good blender, I used my NutriBullet, and a nut milk bag. I bought my nut milk bag at Bed Bath and Beyond for $3, but it can also be found on amazon. The first step is to soak two cups of almonds in filtered water for up to 12 hours. Soaking the almonds breaks down the phytic acid and enzyme inhibitors, two ingredients that hinder the body’s ability to absorb nutrients. Once soaked, the almonds can be drained and rinsed, then added to a powerful blender with pure water until smooth. Once blended, the homemade almond milk will need to be strained through a nut milk bag into a large bowl or jar. This process takes a few minutes, and it leaves behind almond pulp. Almond pulp can be reused by dehydrating in the oven on the lowest heat for 2 – 3 hours. It then becomes almond flour, which can be used in many gluten free recipes. I have made cookies, bread, and hummus with my almond pulp. This recipe makes about half a gallon of almond milk, which can be stored in the fridge for up to four days. 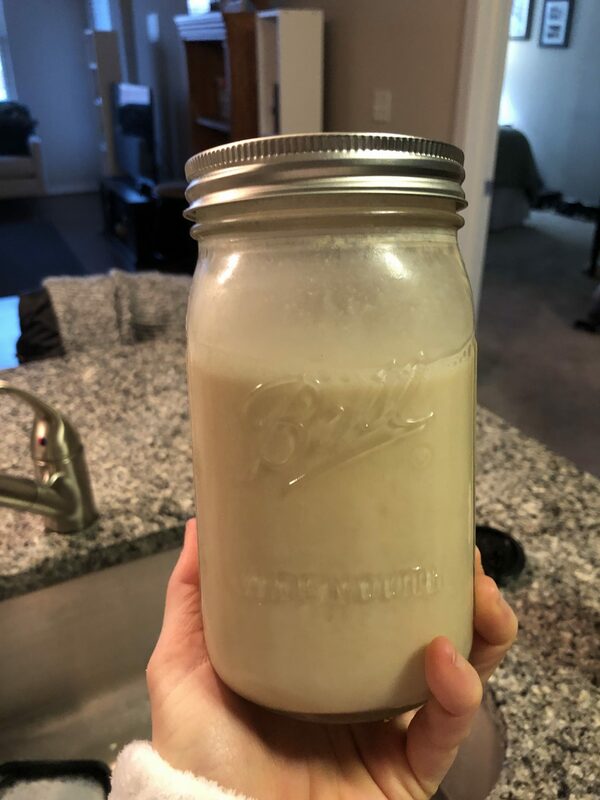 Homemade almond milk is delicious and much creamier than regular store bought. I highly suggest giving this recipe a try, as I’m no Patti LaBelle and this was relatively easy for me. I have discovered you can make almost anything with a good blender!